What is systemic lupus erythematosus? What are the different types of lupus? What are risk factors and causes of systemic lupus erythematosus? Is lupus contagious? Is lupus hereditary? How do health care professionals diagnose systemic lupus erythematosus? What specialties of health care professionals treat lupus? What is the treatment for systemic lupus? Is there a cure for lupus? Is there a systemic lupus erythematosus diet? How can a lupus patient help prevent diseaseactivity (flares)? How can systemic lupus erythematosus affect pregnancy or the newborn? What is the prognosis of lupus? What does the future hold for people with systemiclupus? Where can one get more information about systemic lupus erythematosus? The cause(s) of systemic lupus erythematosus is (are) unknown, however, heredity, viruses, ultraviolet light, and drugs all may play some role. Eleven criteria help health care professionals to diagnose systemic lupus erythematosus. Treatment of systemic lupus erythematosus is directed toward decreasing inflammation and/or the level of autoimmune activity with anti-inflammatory medications for those with mild symptoms and corticosteroids and/or cytotoxic drugs (chemotherapy) for those with more severe lupus. People with systemic lupus erythematosus can prevent "flares" of disease by avoiding sun exposure, not abruptly discontinuing medications, and monitoring their condition with their doctor. Lupus is an autoimmune disease characterized by acute and chronic inflammation of various tissues of the body. Autoimmune diseases are illnesses that occur when the body's tissues are attacked by its own immune system. The immune system is a complex system within the body that is designed to fight infectious agents, such as bacteria and other foreign microbes. One of the ways that the immune system fights infections is by producing antibodies that bind to the microbes. People with lupus produce abnormal antibodies in their blood that target tissues within their own body rather than foreign infectious agents. These antibodies are referred to as autoantibodies. Because the antibodies and accompanying cells of inflammation can affect tissues anywhere in the body, lupus has the potential to affect a variety of areas. Sometimes lupus can cause disease of the skin, heart, lungs, kidneys, joints, and/or nervous system. When only the skin is involved by rash, the condition is called lupus dermatitis or cutaneous lupus erythematosus. A form of lupus dermatitis that can be isolated to the skin, without internal disease, is called discoid lupus erythematosus. When internal organs are involved, the condition is referred to as systemic lupus erythematosus (SLE). Both discoid lupus erythematosus and systemic lupus are more common in women than men (about eight times more common). The disease can affect all ages but most commonly begins from 20-45 years of age. Statistics demonstrate that lupus is somewhat more frequent in African Americans and people of Chinese and Japanese descent. Lupus is not caused by an infectious microorganism and is not contagious from one person to another. Genetic factors increase the tendency of developing autoimmune diseases, and autoimmune diseases such as lupus, rheumatoid arthritis, and autoimmune thyroid disorders are more common among relatives of people with lupus than the general population. Moreover, it is possible to have more than one autoimmune disease in the same individual. Therefore, "overlap" syndromes of lupus and rheumatoid arthritis, or lupus and scleroderma, etc., can occur. Some scientists believe that the immune system in lupus is more easily stimulated by external factors like viruses or ultraviolet light. Sometimes, symptoms of lupus can be precipitated or aggravated by only a brief period of sun exposure. It also is known that some women with systemic lupus erythematosus can experience worsening of their symptoms prior to their menstrual periods. This phenomenon, together with the female predominance of systemic lupus erythematosus, suggests that female hormones play an important role in the expression of SLE. This hormonal relationship is an active area of ongoing study by scientists. Research has demonstrated evidence that a key enzyme's failure to dispose of dying cells may contribute the development of systemic lupus erythematosus. The enzyme, DNase1, normally eliminates what is called "garbage DNA" and other cellular debris by chopping them into tiny fragments for easier disposal. Researchers turned off the DNase1 gene in mice. The mice appeared healthy at birth, but after six to eight months, the majority of mice without DNase1 showed signs of systemic lupus erythematosus. Thus, a genetic mutation in a gene that could disrupt the body's cellular waste disposal may be involved in the initiation of systemic lupus erythematosus. People with SLE can develop different combinations of symptoms and organ involvement. poor circulation to the fingers and toes with cold exposure (Raynaud's phenomenon). Complications of organ involvement can lead to further symptoms that depend on the organ affected and severity of the disease. SLE-associated skin manifestations can sometimes lead to scarring. In discoid lupus, only the skin is typically involved. 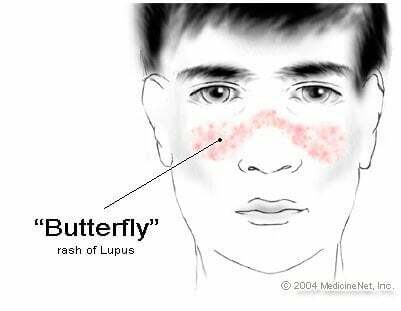 The skin rash in discoid lupus often is found on the face and scalp. It usually is red and may have raised borders. Discoid lupus rashes are usually painless and do not itch, but scarring can cause permanent hair loss (alopecia). Over time, 5%-10% of those with discoid lupus may develop SLE. Typically, with treatment, this rash can heal without permanent scarring. Most SLE patients will develop arthritis during the course of their illness. Arthritis from SLE commonly involves swelling, pain, stiffness, and even deformity of the small joints of the hands, wrists, and feet. Sometimes, the arthritis of SLE can mimic that of rheumatoid arthritis (another autoimmune disease). More serious organ involvement with inflammation occurs in the brain, liver, and kidneys. White blood cells can be decreased in SLE (referred to as leukopenia or leucopenia). Also, low blood-clotting factors called platelets (thrombocytopenia) can be caused by lupus. Leukopenia can increase the risk of infection, and thrombocytopenia can increase the risk of bleeding. Low red blood cell counts (hemolytic anemia) can occur. Inflammation of the lining of the lungs (pleuritis) with pain aggravated by deep breathing (pleurisy) and of the heart (pericarditis) can cause sharp chest pain. The chest pain is aggravated by coughing, deep breathing, and certain changes in body position. The heart muscle itself rarely can become inflamed (carditis). It has also been shown that young women with SLE have a significantly increased risk of heart attacks due to coronary artery disease. Kidney inflammation in SLE (lupus nephritis) can cause leakage of protein into the urine, fluid retention, high blood pressure, and even kidney failure. This can lead to further fatigue and swelling (edema) of the legs and feet. With kidney failure, machines are needed to cleanse the blood of accumulated waste products in a process called dialysis. Involvement of the brain can cause personality changes, thought disorders (psychosis), seizures, and even coma. Lupus of the nervous system (neurologic lupus) can lead to damage to nerves cause numbness, tingling, and weakness of the involved body parts or extremities. Brain involvement is referred to as lupus cerebritis. Some people with SLE have Raynaud's phenomenon. Raynaud's phenomenon causes the blood vessels of the hands and feet to spasm, especially upon exposure to cold. The blood supply to the fingers and/or toes then becomes compromised, causing blanching, whitish and/or bluish discoloration, and pain and numbness in the exposed fingers and toes. Other diseases and conditions that can accompany lupus include fibromyalgia, coronary heart disease, nonbacterial valvular heart disease, pancreatitis, esophagus disease with difficulty swallowing (dysphagia), swollen lymph nodes (lymphadenopathy), liver disease (lupoid hepatitis), infections, and a tendency to spontaneous blood clotting and thrombosis. Since SLE patients can have a wide variety of symptoms and different combinations of organ involvement, no single test establishes the diagnosis of systemic lupus. To help doctors improve the accuracy of the diagnosis of SLE, 11 criteria were established by the American Rheumatism Association. These 11 criteria are closely related to the symptoms discussed above. Some people suspected of having SLE may never develop enough criteria for a definite diagnosis. Other people accumulate enough criteria only after months or years of observation. When a person has four or more of these criteria, the diagnosis of SLE is strongly suggested. Nevertheless, the diagnosis of SLE may be made in some settings in people with only a few of these classical criteria, and treatment may sometimes be instituted at this stage. Of these people with minimal criteria, some may later develop other criteria, but many never do. Note: Ultimately, in patients with kidney disease from systemic lupus erythematosus (lupus nephritis), a kidney biopsy may be necessary to both define the cause of the kidney disease as being lupus-related as well as to determine the stage of the kidney disease in order to optimally guide treatments. Kidney biopsies are often performed by fine-needle aspiration of the kidney under radiology guidance, but in certain circumstances, a kidney biopsy can be done during an open abdominal operation. Blood-count abnormalities: low white blood count (WBC) or red blood count (RBC), or platelet count on routine complete blood count testing; leukopenia, anemia, and thrombocytopenia, respectively. Each of these are detectable with standard complete blood count testing (CBC). In addition to the 11 criteria, other tests can be helpful in evaluating people with SLE to determine the severity of organ involvement. These include routine testing of the blood to detect inflammation (for example, the erythrocyte sedimentation rate, or ESR, and the C-reactive protein, or CRP), blood-chemistry testing, direct analysis of internal body fluids, and tissue biopsies. Abnormalities in body fluids (joint or cerebrospinal fluid) and tissue samples (kidney biopsy, skin biopsy, and nerve biopsy) can further support the diagnosis of SLE. The appropriate testing procedures are selected for the patient individually by the doctor. Lupus is treated by internal medicine subspecialists called rheumatologists. Depending on whether or not specific organs are targeted, other health specialists who can be involved in the care of patients with lupus include dermatologists, nephrologists, hematologists, cardiologists, pulmonologists, and neurologists. It's not uncommon that a team of such physicians is coordinated by the treating rheumatologist together with the primary care doctor. There is no permanent cure for SLE. The goal of treatment is to relieve symptoms and protect organs by decreasing inflammation and/or the level of autoimmune activity in the body. The precise treatment is decided on an individual basis. Many people with mild symptoms may need no treatment or only intermittent courses of anti-inflammatory medications. Those with more serious illness involving damage to internal organ(s) may require high doses of corticosteroids in combination with other medications that suppress the body's immune system. People with SLE need more rest during periods of active disease. Researchers have reported that poor sleep quality was a significant factor in developing fatigue in people with SLE. These reports emphasize the importance for people and physicians to address sleep quality and the effect of underlying depression, lack of exercise, and self-care coping strategies on overall health. During these periods, carefully prescribed exercise is still important to maintain muscle tone and range of motion in the joints. To protect from sun sensitivity, sunscreens, sun avoidance, and sun protection clothing are used. Certain types of lupus rash can respond to topical cortisone medications. Nonsteroidal anti-inflammatory drugs (NSAIDs) are helpful in reducing inflammation and pain in muscles, joints, and other tissues. Examples of NSAIDs include aspirin, ibuprofen (Motrin), naproxen (Naprosyn), and sulindac (Clinoril). Since the individual response to NSAIDs varies, it is common for a doctor to try different NSAIDs to find the most effective one with the fewest side effects. The most common side effects are stomach upset, abdominal pain, ulcers, and even ulcer bleeding. NSAIDs are usually taken with food to reduce side effects. Sometimes, medications that prevent ulcers while taking NSAIDs, such as misoprostol (Cytotec), are given simultaneously. Corticosteroids are more potent than NSAIDs in reducing inflammation and restoring function when the disease is active. Corticosteroids are particularly helpful when internal organs are affected. Corticosteroids can be given by mouth, injected directly into the joints and other tissues, or administered intravenously. Unfortunately, corticosteroids have serious side effects when given in high doses over prolonged periods, and the doctor will try to monitor the activity of the disease in order to use the lowest doses that are safe. Side effects of corticosteroids include weight gain, thinning of the bones and skin, infection, diabetes, facial puffiness, cataracts, and death (necrosis) of the tissues in large joints. Hydroxychloroquine (Plaquenil) is an antimalarial medication found to be particularly effective for SLE people with fatigue, skin involvement, and joint disease. Consistently taking Plaquenil can prevent flare-ups of lupus. Side effects are uncommon but include diarrhea, upset stomach, and eye-pigment changes. Eye-pigment changes are rare but require monitoring by an ophthalmologist (eye specialist) during treatment with Plaquenil. Researchers have found that Plaquenil significantly decreased the frequency of abnormal blood clots in people with systemic lupus. Moreover, the effect seemed independent of immune suppression, implying that Plaquenil can directly act to prevent the blood clots. This fascinating study highlights an important reason for people and doctors to consider Plaquenil for long-term use, especially for those SLE people who are at some risk for blood clots in veins and arteries, such as those with phospholipid antibodies (cardiolipin antibodies, lupus anticoagulant, and false-positive venereal disease research laboratory test). This means not only that Plaquenil reduces the chance for re-flares of SLE, but it can also be beneficial in thinning the blood to prevent abnormal excessive blood clotting. Plaquenil is commonly used in combination with other treatments for lupus. For resistant skin disease, other antimalarial drugs, such as chloroquine (Aralen) or quinacrine, are considered and can be used in combination with hydroxychloroquine. Alternative medications for skin disease include dapsone and retinoic acid (Retin-A). Retin-A is often effective for an uncommon wart-like form of lupus skin disease. For more severe skin disease, immunosuppressive medications are considered as described below. Medications that suppress immunity (immunosuppressive medications) are also called cytotoxic drugs. They are sometimes referred to as chemotherapy because they are also used to treat cancer, generally in much higher doses than those used to treat lupus. Immunosuppressive medications are used for treating people with more severe manifestations of SLE, such as damage to internal organ(s). Examples of immunosuppressive medications include azathioprine (Imuran), cyclophosphamide (Cytoxan), chlorambucil (Leukeran), cyclosporine (Sandimmune), and the disease-modifying drug methotrexate (Rheumatrex, Trexall). All immunosuppressive medications can seriously depress blood-cell counts and increase risks of infection and bleeding. Immunosuppressive medications may not be taken during pregnancy or conceptionbecause of risk to the fetus. Other side effects are specific for each drug. For examples, methotrexate can cause liver toxicity, while cyclosporine can impair kidney function. In recent years, mycophenolate mofetil (CellCept) has been used as an effective medication for lupus, particularly when it is associated with kidney disease. CellCept has been helpful in reversing active lupus kidney disease (lupus renal disease) and in maintaining remission after it is established. Its lower side-effect profile has advantage over traditional immune-suppression medications. In SLE patients with serious brain (lupus cerebritis) or kidney disease (lupus nephritis), plasmapheresis is sometimes used to remove antibodies and other immune substances from the blood to suppress immunity. Plasmapheresis is a process of removing blood and passing the blood through a filtering machine, then returning the blood to the body with its antibodies removed. Rarely, people with SLE can develop seriously low platelet levels, thereby increasing the risk of excessive and spontaneous bleeding. Since the spleen is believed to be the major site of platelet destruction, surgical removal of the spleen is sometimes performed to improve platelet levels. Other treatments have included plasmapheresis and the use of male hormones. Plasmapheresis has also been used to remove certain harmful proteins (cryoglobulins) that can lead to vasculitis. End-stage kidney damage from SLE requires dialysis and/or a kidney transplant. Research is indicating benefits of rituximab (Rituxan) in treating lupus. Rituximab is an intravenously infused antibody that suppresses a particular white blood cell, the B cell, by decreasing their number in the circulation. B cells have been found to play a central role in lupus activity, and when they are suppressed, the disease tends toward remission. This may particularly helpful for people with kidney disease. Another new B-cell-suppressing treatment is belimumab (Benlysta). Belimumab blocks the stimulation of the B cells (a B-lymphocyte stimulator or BLyS-specific inhibitor) and is approved for the treatment of adults with active autoantibody-positive systemic lupus erythematosus who are receiving standard therapy. It is important to note that the efficacy of belimumab has not been evaluated in patients with severe active lupus nephritis or severe active central nervous system lupus. Belimumab has not been studied in combination with other biologic therapies or intravenous cyclophosphamide. While there is no specific lupus diet, scientists have found that low-dose diet supplementation with omega-3 fish oils could help patients with lupus by decreasing inflammation and disease activity and possibly decreasing heart-disease risk. It is generally recommended that patients with lupus eat a balanced diet that includes plant-based foods and lean sources of protein. DHEA (dehydroepiandrosterone) has been helpful in reducing fatigue, improving thinking difficulties, and improving quality of life in people with SLE. Recent research indicates that DHEA diet supplementation has been shown to improve or stabilize signs and symptoms of SLE. DHEA is commonly available in health-food stores, pharmacies, and many groceries. SLE is undoubtedly a potentially serious illness with involvement of numerous organ systems. However, it is important to recognize that most people with SLE lead full, active, and healthy lives. Periodic increases in disease activity (flares) can usually be managed by varying medications. Since ultraviolet light can precipitate and worsen flares, people with systemic lupus should avoid sun exposure. Sunscreens and clothing covering the extremities can be helpful. Abruptly stopping medications, especially corticosteroids, can also cause flares and should be avoided. People with SLE are at increased risk of infections as SLE-related complications, especially if they are taking corticosteroids or immunosuppressive medications. Therefore, any unexpected fever should be reported to medical professionals and evaluated. Lupus pregnancy deserves special review because it presents unique challenges. Pregnant women with SLE are considered high-risk pregnancies. These pregnancies require interactive monitoring generally by a skilled rheumatologist together with an obstetrician expert in high-risk pregnancies. Women with SLE who are pregnant require close observation during pregnancy, delivery, and the postpartum period. This includes fetal monitoring by the obstetrician during later pregnancy. These women can have an increased risk of miscarriages (spontaneous abortions) and can have flares of SLE during pregnancy. The presence of phospholipid antibodies, such as cardiolipin antibodies or lupus anticoagulant, in the blood can identify people at risk for miscarriages. Cardiolipin antibodies are associated with a tendency toward blood clotting. Women with SLE who have cardiolipin antibodies or lupus anticoagulant may need blood-thinning medications (aspirin with or without heparin) during pregnancy to prevent miscarriages. Other reported treatments include the use of intravenous gamma globulin for selected people with histories of premature miscarriage and those with low blood-clotting elements (platelets) during pregnancy. Pregnant women who have had a previous blood-clotting event may benefit by continuation of blood-thinning medications throughout and after pregnancy for up to six to 12 weeks, at which time the risk of clotting associated with pregnancy seems to diminish. Plaquenil has now been found to be safe for use to treat SLE during pregnancy. Corticosteroids, such as prednisone, are also safely used to treat certain manifestation of lupus during pregnancy. Lupus antibodies can be transferred from the mother to the fetus and result in lupus illness in the newborn ("neonatal lupus"). This includes the development of low red cell counts (hemolytic anemia) and/or white blood cell counts (leucopenia) and platelet counts (thrombocytopenia) and skin rash. Problems can also develop in the electrical system of the baby's heart (congenital heart block). Occasionally, a pacemaker for the baby's heart is needed in this setting. Neonatal lupus and congenital heart block are more common in newborns of mothers with SLE who carry specific antibodies referred to as anti-Ro (or anti-SSA) and anti-La (or anti-SSB). (It is helpful for the newborn baby's doctor to be made aware if the mother is known to carry these antibodies, even prior to delivery. The risk of heart block is 2%; the risk of neonatal lupus is 5%.) Neonatal lupus usually clears after 6 months of age, as the mother's antibodies are slowly metabolized by the baby. Overall, the outlook for people living with systemic lupus is improving each decade with the development of more accurate monitoring tests and treatments. The role of the immune system in causing diseases is becoming better understood through research. This knowledge will be applied to design safer and more effective treatment methods. For example, completely revising the immune system of people with extremely aggressive treatments that virtually temporarily wipe out the immune system is being evaluated. Current studies involve immune eradication with or without replacement of cells that can reestablish the immune system (stem-cell transplantation). It should be noted that people with SLE are at a somewhat increased risk for developing cancer. The cancer risk is most dramatic for blood cancers, such as leukemia and lymphoma, but is also increased for breast cancer. This risk probably relates, in part, to the altered immune system that is characteristic of SLE. Women with SLE appear to be at increased risk for heart disease (coronary artery disease) according to recent reports. Women with SLE should be evaluated and counseled to minimize risk factors for heart disease, such as elevated blood cholesterol, quitting smoking, high blood pressure, and obesity. Landmark research has shown clearly that oral contraceptives do not increase the rate of flares of systemic lupus erythematosus. This important finding is opposite to what has been thought for years. Now we can reassure women with lupus that if they take birth-control pills, they are not increasing their risk for lupus flares. Note: Birth-control pills or any estrogen medications are still be avoided by women who are at increased risk of blood clotting, such as women with lupus who have phospholipid antibodies (including cardiolipin antibody and lupus anticoagulant). Individuals living with SLE can improve their long-term prognosis by learning about the many aspects of the illness as well as closely monitoring their own health with their doctors. "Antiphospholipid Antibody Syndrome." Mar. 21, 2016. National Resource Center on Lupus. <https://resources.lupus.org/entry/antiphospholipid-antibody-syndrome>. "Antiphospholipid Syndrome." March 2017. American College of Rheumatology. ?<https://www.rheumatology.org/I-Am-A/Patient-Caregiver/Diseases-Conditions/Antiphospholipid-Syndrome>. García-Carrasco M1, Mendoza-Pinto C, Cardiel MH, Méndez-Martínez S, García-Villaseñor A, Jiménez-Hernández C, Alonso-García NE, Briones-Rojas R, Ramos-Álvarez G, López-Colombo A. "Health related quality of life in Mexican women with systemic lupus erythematosus: a descriptive study using SF-36 and LupusQoL(C)." Lupus 21.11 Oct. 2012. <https://www.ncbi.nlm.nih.gov/pubmed/22875651>. Grenn, Robert C., et al. "Endothelial progenitor dysfunction associates with a type I interferon signature in primary antiphospholipid syndrome." Ann Rheum Dis 76.2 July 18, 2016. <https://ard.bmj.com/content/76/2/450>. Harley, J.B., and J.A. James. "Epstein-Barr virus infection induces lupus autoimmunity." Bull NYU Hosp Jt Dis 64(1-2) 2006: 45-50. Moyssakis, I., et al. "Libman-Sacks endocarditis in systemic lupus erythematosus: prevalence, associations, and evolution." Am J Med 120.7 July 2007: 636-642. Teruel, M. and M.E. Alarcon-Riquelme. "The genetic basis of systemic lupus erythematosus: What are the risk factors and what have we learned." J Autoimmun 74 November 2016: 161-175.